This spectacular apartment has been fully renovated to a very high standard, so pretty much everything is in perfect condition! 1 lounge room/dining area fully furnished, including entertainment system. 1 full kitchen with granite benches, quality appliances, cooking utensils, and tableware for 4 people. Air-conditioning, dishwasher, convection microwave oven, fridge, vacuum cleaner. 37" LCD wall mounted TV, DVD Player, Hi-Fi System. Off-street security car park for 1 car (Deposit required for security keys). Modest sized, roof-top communal pool. Building has own coin operated laundry facilities. Building has 2 lifts for apartments, no stairs required to get to apartment. Stunning 1 bedroom executive apartments, fully furnished for up to family of 3 people, ideal for 2 adults. Located in the heart of Manly, close to everything. Only 100 meters from Sydney's world-famous Manly beach. This sub-penthouse level gem offers sweeping ocean views. It is the perfect place for a beach holiday, a romantic getaway, or a base to explore the beautiful city of Sydney. Only 500m away you will find Manly wharf, from where you can enjoy a scenic 30 minute trip on the famous Manly ferry into Sydney's central business district. Me and my wife are semiretired babyboomers. Holiday accommodation activity gives us a great opportunity to meet and serve new people, often from most fascinating and exciting backgrounds. Firstly the location: The apartment is close to all the best Manly has to offer including shopping, restaurants, the beach, and easy transport to central Sydney. 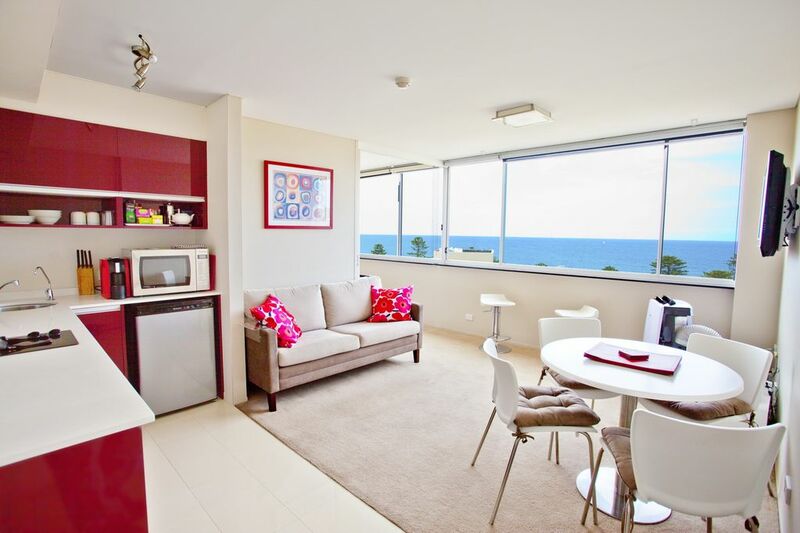 Secondly stunning views from the apartment - the apartment wide spectacular ocean panorama over Manly Ocean beach. Obviously in our age we were also looking ease-of-access and safety aspects of the building; there is level entry into the building and the lift - no steps from the street to the apartment! The building is in a security building with 24/7 CCTV monitoring and electronic key entry system. No need to have a car to explore everything what Sydney offers in one of the most beautiful locations in Australia. Mobile phone for non-Australian guests: Nokia 207 or similar with a local SIM and Au$10 credit from Amaysim.com.au for the duration of the stay in our apartment - complimentary. Dedicated high-speed unlimited internet accessible via both Wi-Fi and cable - complimentary. Manly Golf Club 2km away. Warringah Golf Club 3km away. Balgowlah Golf Club 3km away. Outside: Roof top has a terrace for residents, and a shared plunge pool. The apartment had fantastic views of the Manly beach and was in an excellent location to participate in all the excitement in town. We were met at the apartment and had a thorough welcome and introduction to the building and the individual workings of the apartment. We did not have a car but easily took the public bus up the coast to Palm Beach and the ferry to the zoo. We also walked many of the trails, swam in the ocean and had a great time just hanging out. The place was very clean and had all the amenities we needed. There was even coffee and milk. We would definitely recommend this apartment and would love to visit there again. We enjoyed a wonderful month in this comfortable, well appointed apartment - our third holiday here! Well managed, clean and prompt response to any problems (not that there were any worth mentioning). Very hospitable and friendly hosts. For my first ever visit to Australia, I was looking for somewhere to use as a base for a month, somewhere not to busy but then not too far from main attractions either. I found this apartment on a google search, it was one of the first I found so I went for it. It looked good, the view was amazing so why not. Well it did not disappoint, the owner was first class, he answered every email within 24 hours even allowing for the huge time difference. I had many questions, this was a big deal for me, long holiday this being just a short part of an 8 week world tour. When we arrived, the owner was waiting right outside with keys in hand just as he had promised,everything was exactly as we expected. when I walked into the flat, it was just like the pictures had been taken that very day. The view across Manly beach was picture postcard perfect,with the window open we could hear the waves on the beach. Sydney city centre just a short exciting ferry ride away we had a terrific time here. Take the slow ferry, just 30 minutes & you never have to wait long for the next one, take in all the views. If you are in a hurry the 15 minute catamaran is an option but why rush. Buy the weekly ticket that gets you all ferries, buses locally, you will be on & off ferries all day if you want. Go to Darling harbour, the Zoo, Blue Mountains. To be honest we did not spend that much time in the flat, but you will not be wanting for anything, there was more equipment in this flat than I have at home. There was tea, coffee & milk fresh waiting for us on a arrival, convenience store just across the road & a 5 to 10 minute walk from the ferry terminal. Yes I would recommend this flat to anyone, a week or a month as we did you will not be sorry. The laundry facilities are on the roof with such spectacular views you can sunbathe up there, have a barbecue, just so much good about it. There is plenty to do in Manly you do not need to go anywhere else but why not explore. There are free bus services that take you to outlying areas. You can take in some amazing country walks. The views over Sydney harbour cannot be imagined, even my photographs do not do it justice. Yes I would go back, I do not have plans to do so just yet, I've only just got back to the UK. When I do I know where I will be going. After a short business trip to NZ I decided to stop over for 4 days in Sydney. Finding accommodation was a challenge at short notice until I stumbled across this place. Too busy to look at the pictures -I was just happy to find a room, it was a huge surprise when the door opened to reveal the most amazing view across Manly beach! The apartment is so well appointed - a espresso machine etc, and is clean and bright. The location is perfect, a short stroll to the ferry, the beach or any of the numerous bars and restaurants. Manly is a great place for the active, every morning a group of about 100 swimmers set off across the bay and when I was here there was a fun run on the Sunday. Water sports abound - obviously! I used public transport whilst here and would recommend anyone else to do the same. In fact the ferry from Circular Quay has been a highlight of the trip - perfect way to unwind after a busy day of sightseeing. Overall this has been an amazing place to stay whilst in Sydney. I normally stay in fairly upmarket hotels with business but you'd be looking at. "Presidential Suite" to match what is on offer here. Thank you to Jarmo for being so welcoming, I hope to come again! Fishing, sailing, kayaking, and other water sports nearby. Changeover Day: Flexible Notes on prices: Prices are for the property per night / per week / per month in Australian dollars. Check-in Notes: When checking-in we request a credit card authorization to guarantee any incidentals to the apartment, it is available at the following link: http://www.SydneyAccommodation.info/Authorization.htm A printed copy will be available upon checking in, or it can be printed and filled in prior to arrival. If no credit card is available, we can offer other arrangements.